Welcome Q13 Fox Viewers! Resources to Save on Groceries & Summer Fun in the NW! A big welcome to those of you who are new readers after watching me on the Q13 Fox morning show today! I had the privilege to share about ways to save money on groceries and Summer Fun for the family. We also shared money-saving tips featured all morning long on Q13 – saving money on gas, dining out, buying clothes & more! Find the grocery store sales for the week, and coupon match ups for those on our Grocery Savings page here. Download the Favado app we mentioned here to help save more on groceries! 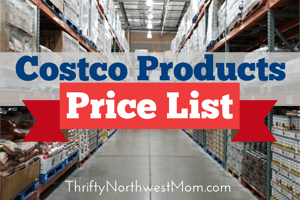 Check out our Costco Price list here, if you are looking for the best Costco Prices. Take a Staycation in Seattle! Find information on free skate programs, free bowling, free movies, free fishing days and more on our Summer Fun in the NW page here! How to make a Summer Bucket List for your family! Find inspiration for affordable NW Travel ideas here or on our Summer Fun page here!